AMAZON SUPPORTS WESTHOFF COMMUNITY CLUB! 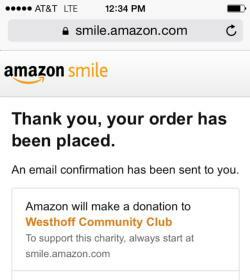 Please enroll your Amazon account for Amazon Smile which will automatically donate .50% of qualified purchases to Westhoff Community Club as your charity of choice! Westhoff CC receives donation automatically from Amazon and details of your purchase are not shared and remain confidential. Click link to enroll in Amazon Smile! Make sure you now use the URL: http://smile.amazon.com from your desktop computer or smartphone's browser when shopping on Amazon. The Amazon App doesn't work. 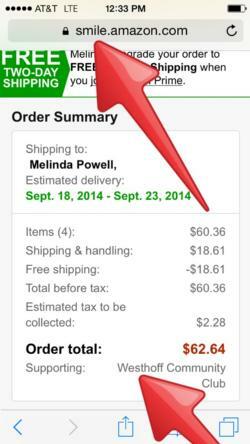 Examples of AmazonSmile purchase confirmation for Westhoff Community Club from smartphone displayed on the right. Westhoff is an official Project Lead The Way School! Community Club exists to support the educational objectives of Westhoff. Westhoff Community Club, a non-profit organization, is parents’ way to support a positive environment for our students where 100% of funding is dedicated to the students.The parent volunteers of Westhoff Community Club assist inside and outside the classroom to enrich students' experiences by maintaining a positive environment which promotes student learning and success. Each year, time and energy are expended by parents to help manage library services, help in classrooms with students or preparing materials and organizing special events such as our, Culture Fair, Family Festival, Book Fair, Classroom Events and room activities such as holiday classroom parties. Use of funds are 100% dedicated toward our students to support programs such as technology, field trips, class materials, emergency supplies and equipment, school enhancements, office equipment and educational assemblies and much, much more. The Westhoff Community Club meets on the second Friday of each month at 8:45 A.M. in the workroom. We welcome all to join us!